I chose a couple papers from the Mother's Day Key Ingredients to use. First I traced the frame on a sheet of 8 1/2" x 11" Prism cardstock and cut it out. 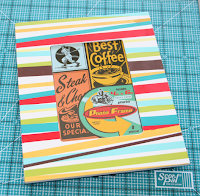 I used some mod podge to adhere it to the frame. While that dried I gathered up the rest of my supplies. 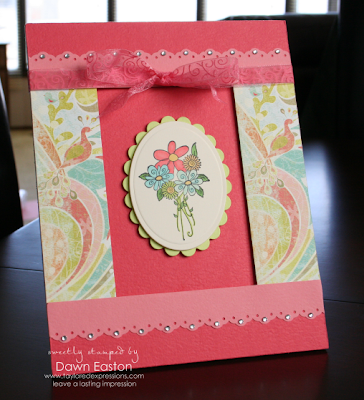 Since I don't want to send this frame without a photo I decided to make a focal image using the Fresh Flowers stamp set. The image was stamped with Memento Black ink onto Choice Buttercream cardstock which is available in the Mother's Day Key Ingredients or in a package of 25 sheets. I then coloured with some Copic markers and cut it out with some oval nestabilities. Speaking of nestibilities....did you see that Taylored Expressions is now carrying a great selection of Spellbinders products! I've finished the frame off with some gorgeous ribbon and Kaiser Rhinestones from the kit as well! Now I will gift this to my Grandmother for Mother's Day next month and she can either choose to leave the image in or take it out and insert a photograph. Below you will see a snapshot of what the frame looked like before I started! Dawn, it's so beautiful!! Everything is tied together just right, gorgeous!! Awesome, Dawn! GREAT way to show off the fun colors in the Key Ingredients! Dawn,this looks awesome.Your grandmother will love it.Love the colors. Very pretty Dawn! Frames are always so much fun to alter! THis is just GORGEOUS, Dawn! What a beautiful frame!